Government and Business: American Political Economy in Comparative Perspective 3 Edition In the wake of worldwide economic turmoil and efforts toward recovery, understanding the interdependence of government and business is more important than ever. 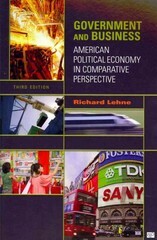 In this thoroughly updated edition, Lehne takes a comparative approach, evaluating the U.S. political economy with respect to those of Great Britain, Germany, Japan, and the EU. The book provides detailed historical context for, and a conceptual understanding of, the business-government environment, and then clarifies the roles of the major actors and outlines the regulatory and policy frameworks. Along the way, Lehne probes some of the most crucial dilemmas facing government and business today.Updates to this edition include:* expanded coverage of ethics as it relates to government and business;* greater attention to China in particular in the feature boxes on developing nations; and* a look at relations between government and business at the subnational level.A comprehensive glossary and chapter summaries enhance student learning.